In white subtitles at the beginning of The Two of Us, director (and co-writer) Claude Berri describes his feature filmmaking debut as a true story that's been filtered through the imagination of a child. 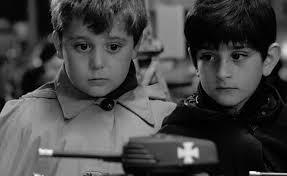 Giving the mischievous eight-year-old who anchors the film his own name of Claude Langmann, it isn't long before we discover that the child in question is Berri himself. 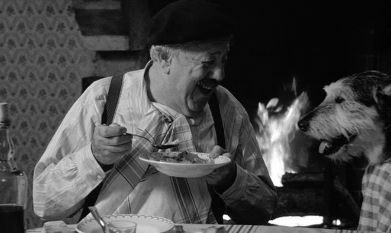 And although he filters his memories of childhood spent as a Jewish youth posing as a Catholic while living with his landlady's aging, antisemitic father in the French countryside during World War II through his own imagination, Berri paints the other characters in this tender black-and-white film with the same brush. Featuring multiple scenes of storytelling – from the way Claude's tough but loving father uses Mickey Mouse to teach his son the lessons he'll need to stay safe and hide his identity to some of the ridiculous, racist proclamations made by his future guardian which confuse and challenge them both – Berri blends fact and fiction together repeatedly, going beyond dialogue to establish a recurring theme. In doing so, he pays tribute to the two men (and to a lesser extent, the two women) who had the greatest impact on his formative years and the way he expresses himself creatively as an adult. 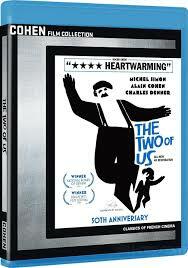 But The Two of Us takes its metaphors a step further as evidenced in a memorable segue from Jewish city life to that of the Catholic countryside when Claude's father teaches him the "Our Father" prayer, which leads him to his next father figure. 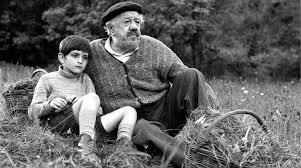 As Pepe, a former plumber who now spends most of his time tending to the animals that live on their sprawling land alongside him, his wife, and his beloved dog, actor Michel Simon gives a Berlin Film Festival award-winning performance. And, of particular importance for the film, Simon plays exceptionally well off of young Alain Cohen's protagonist and audience substitute. Infusing the bittersweet film with unexpected flashes of laughter and light, Berri's work takes terrific inspiration regarding how to tell an otherwise grown-up story through the eyes of a child from Francois Truffaut's similarly semi-autobiographical Antoine Doinel series (most notably the first film The 400 Blows). Likewise to Berri’s credit, various elements in The Two of Us from plot to tone appear to have influenced a few contemporary classics in their own right from Lasse Hallstrom's My Life as a Dog and Giuseppe Tornatore's Cinema Paradiso to Jan Sverak's Kolya and beyond. 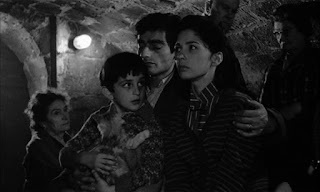 Co-written by Michel Rivelin and Berri's longtime collaborator Gerard Brach, cinematographer Jean Penzer's lushly photographed work – which had been given a jaw-dropping 4k restoration by PATHE back in 2015 ahead of the 1967 film's fiftieth anniversary – makes a stunning transition to Cohen Film Collection Blu-ray. Yet even more than its razor sharp visuals, Georges Delerue's moving score immediately gets to me with a theme that will stay in your head all day. Just one of dozens of staggering Delerue compositions including Hiroshima Mon Amour, Jules and Jim, Contempt, Anne of a Thousand Days, and Julia, from the opening notes that play on the Blu-ray menu and all the way through Two's eighty-seven minute running time, we're utterly captivated by the Oscar winner's score. And when the music is combined with visuals that capture a punched up version of reality as well as Berri's commitment to emotional authenticity, we find ourselves – much like Claude listening to a story – completely under its imaginative spell.